It’s that time of year again and party season is upon us! Whether you’re planning some christmas day treats or just craving a little holiday indulgence, one thing’s for sure – you can’t go past bliss balls! These bliss balls are a paleo favourite, being gluten-free, dairy-free and guilt free. The recipe below can easily be adapted, think of it as a template. There are so many different things you could add – cacao powder, rum, buckinis, dried fruit (if you dig apricot), cacao nibs, raisins… Get creative! Pit your dates and process them in a food processor until smooth. Into the food processor, add the banana, cashews, coconut, chia seed and coconut oil (and cacao powder and rum if you choose!). Process until the cashews have broken down into a crumb, and the consistency is sticky but not wet. If you find it’s too wet – add more cashews and coconut. If it’s too dry, try some more coconut oil, banana or even water. Roll mixture into balls and coat with desiccated coconut. Refrigerate overnight to firm them up. 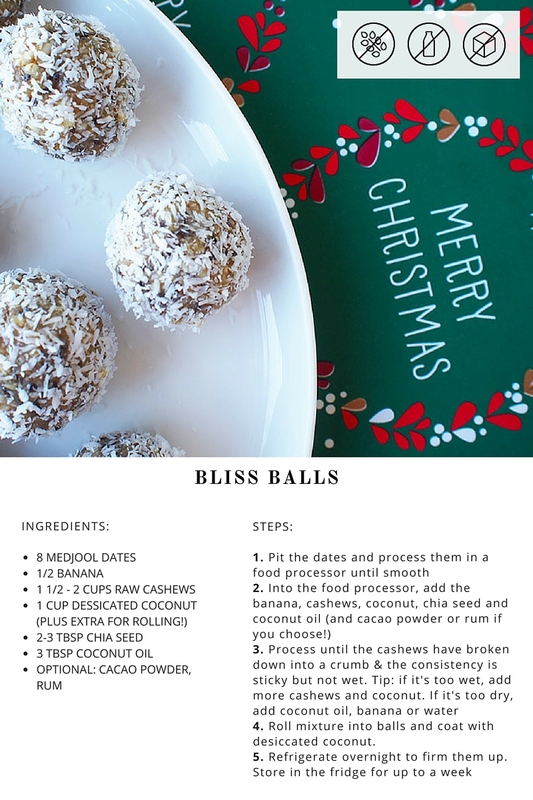 Get access to a printable copy of our paleo bliss ball recipe to add to your collection!